The Transition Companion is a guidebook for creating community changes by increasing livability factors in the face of fossil fuel scarcity and climate change. The introduction to this book highlights the practice of permaculture land management, which bears a conspicuous similarity to the American farming practice of summer fallowing in which land is set aside to replenish the soil by leaving it in a natural state for several years. The gist of the book is to show community organizations, both formal and informal, how to build models to increase sustainability locally, with minimal government assistance. 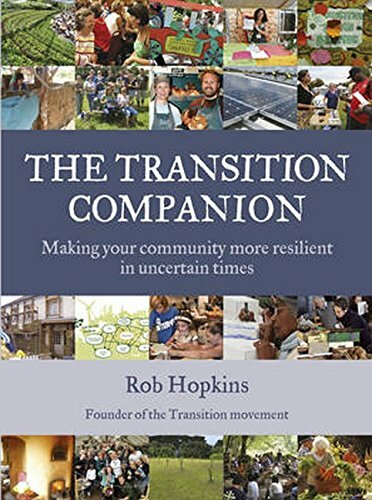 Author Hopkins highlights a number of communities that have modeled such environmental initiatives in the United Kingdom, the United States, Brazil, and elsewhere. Many of us are familiar with the “farm to table” and “buy local” campaigns for food production, but Mr. Hopkins demonstrates how this can be incubated even within large cities. “By 2012, surplus oil production capacity could entirely disappear and as early as 2015, the shortfall in output could reach nearly a million barrels per day,” according to the U.S. Joint Operating Environment 2010 report. If this isn’t enough to make you scared, the NASA data on global warming will really make you sit up and take notice. One of the superior graphics is depicting life beyond the oil peak. One of the questions posed in the book is would a community where urban land be used for food production be happier, of course, look at Italy. For years Italy produced more wine per capita than any other country, despite its small size, because nearly every available meter of terra firma is developed for agriculture, often for small family farms. The book is particularly helpful for people who may not have agrarian experience as it illustrates how urban and suburban cultures can adopt sustainable food production, environmental preservation, and alternative transportation resources for very little capital outlay. Rob Hopkins combines cutting-edge process model analysis with modern scientific data using a pleasantly conversational mode. His appendix at the back of the book is discrete and illuminating for creating the appropriate structure to manifest community changes. Mr. Hopkins’ latest is a workbook, not necessarily a compelling bedside read; but for practical applications in building green communities, The Transition Companion is a relevant, easily consumed tool—printed on recyclable paper.